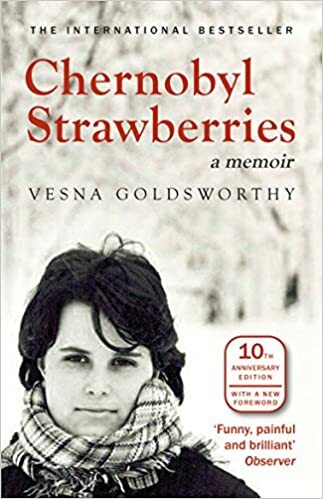 I was drawn to Vesna Goldsworthy’s 2005 memoir Chernobyl Strawberries by her wonderful contribution to Private passions—a valuable companion to the book (Hold the front page! Books are silent! For Serbian soundscapes, see here). Originating as a record for her young son through the trauma of her cancer treatment, the memoir is whimsical and full of insight—both about her early life in Yugoslavia before it was torn apart (she wonders if it was an accident that her country and her own body were disfigured so soon after each other) and her identity in her adopted home in England since 1986, caught between cultures. Only my father saw some consolation in the fact that it was the kind of work which was unlikely to lead to imprisonment. There seemed to be nothing remotely political in transcribing thousand-year-old prayers, whereas as a media star I was likely to shoot my mouth off sooner or later. In our senior common room new members of the Communist Party represented a more raggle-taggle selection than before. Some were visibly keen, some rather diffident, some were obvious (clever-clogs, careerist with a bad sense of timing, those who carried a briefcase to school, prominent members of youth organizations, children of well-known communists who could hardly refuse to join), some rather less so (ditzy girls from old families who had fallen for the old hammer-‘n’-sickle chic, the school poet, the fourth-grade hunk, a good third of the school basketball team, encouraged to join as role models and highly visible because they were all six foot six and chewing gum). Working out which members of the teaching staff belonged to the party, information you wouldn’t normally have been privy to as a student, was part of the privilege conferred by this particular entry into the adult world. Many of our professors addressed us with “Colleague”. Others used “Comrade” or “Miss”, according to whether they were communists or bourgeois recidivists. Forms of address provided an easy way of knowing individual political allegiances. It was useful to be able to distinguish Comrade Professors from Mr or Mrs Professors in order to know whether to cite Lukacs or T.S. Eliot. Although one could often tell the two groups apart simply by the clothes, it was not always safe to make hasty assumptions. Suits, ties and moccasins mostly belonged to comrades; tweed jackets, turtle necks and shoelaces to Mr and Mrs, but safari suits could go both ways, and were surprisingly popular in the early eighties. I felt that, through furniture, I had a special path to understanding the world I came from. Whereas in the West the inexhaustible variety of interior design often manages to obscure surprising degrees of conformity, the enforced conformity of the society I grew up in concealed a bunch of eccentrics and sometimes downright madness. While the wives were crocheting, madmen were busy plotting Armageddon. Goldsworthy describes the schism (and occasional blurring) in poetic circles between bohos and suits, and her own youthful “Penelope poems” about the female who waits ( the waitress) for an absent male, often with pseudo-religious powers. She used the feminine form of the noun. There was no doubt that she had me in mind. Only peasants wrote poetry anyway. (The word peasant, with its full power of character assassination, is not readily translatable into English. It was neither here nor there as far as the real peasantry were concerned, but a poisoned dart if directed at a Belgrade student of letters). The longer it was since his demise, the more there was to celebrate. Like the widow of a murdered Sicilian Mafia don, the country clung to his memory in an incongruous mixture of mourning and décolletage, as if knowing that a collective nervous breakdown would follow once the ritual was no longer observed. Only minutes later, I was on the Piccadilly line—the Ellis Island of London’s huddled masses—with a copy of the London Review of Books. In Private Passions Goldsworthy recalls the abundance of classical (and other) music in the Yugoslavia of her youth. And when she moved to England, her friends and family were horrified, asking, “How could you move to a country where there is no music”? So it’s suitable that her Slavic-tinged playlist ends with Purcell’s When I am laid in earth. I have fewer inhibitions in English—perhaps because for me it doesn’t quite carry subcutaneous layers of pain. In fact, I sense—however irrational this may seem—that the I who speaks English is a very subtly different person from the I who speaks Serbian and the I who speaks French. That, perhaps, has something to do with the old chameleon tricks or the nature of the language itself. At any rate, the English speaker is a bit more more blunt and a bit more direct than the other two. She is and isn’t myself. She takes risks and admits to loss. In the four years between my move to London and her death, Granny wrote to me only once. It was a short letter, penciled in a deliberate hand clearly unused to writing. She reminded me to visit my parents regularly and urged me to behave in a way which would not dishonour my lineage; no laughing in public places, no loud conversation, modesty in dress and in everything else. Granny wrote as though she was worried that, away from my father and my tribe, I might be in danger of succumbing to some ungodly excess. In her world, Montenegrins who lived apart from their tribes were notoriously prone to prodigal or licentious behaviour. Her prompting came not because she lacked confidence in me, but because she clearly believed that this was what a letter from a grandmother to her granddaughter should be like. It wasn’t the place for frivolities of any kind. Although written in continuous lines, her latter was—from the first word to the last—a string of rhythmic pentameters, the verse of Serbian epic poetry. The language of my dead grandmother brings to life all our lost homelands, yet no book has ever been written in it. This is the language I lost when I chose to write in English. Always reflecting on the subjectivity of memory, she has drôle comments on her new jobs in London. I loved the prospect of boredom. Growing up in Eastern Europe was a powerful vaccine. I had gone through eighteen years of socialist education, learning when to say yes and when to keep quiet, in preparation for a job in which I’d be underpaid and under-employed. Where I came from, such jobs—usually in very nice places—were often described as “ideal for women”. My mother-tongue, meanwhile, remained firmly locked in its mid-eighties Serbo-Croat time-capsule, a language which officially doesn’t even exist any more. Daughter of a self-managed workers’ paradise, I excel at my job. I criticize and self-criticize, I censor and self-censor, I compose self-assessment sheets about self-managed time, I sit on teaching and research committees, I attend meetings and take notes, I know that literature has hidden and insidious meanings. […] My communist upbringing, my upbringing in communism—to be able to live with myself without believing in anything I say, to be able to accept things without asking too many questions—has certainly stood me in good stead throughout my working life. In the art of the long meeting, British university workers easily outdid anything I’d encountered in my socialist upbringing. The sessions were often longer than the communist plenaries, the acronyms just as plentiful, the put-downs just as complicatedly veiled in oblique metaphor, the passions just as high, even if the stakes were often infinitesimal. Unlike my ancestral matriarch and so many others in the part of the world where I came from, I have never been a refugee. I am not an exile. Not quite an expatriate either: that term seems to be reserved for those coming from lands which are more fortunate than mine. A migrant, perhaps? That sounds too Mexican. An emigrée? Too Russian. I suddenly grasped the sheer luxury of being a British male in the twentieth century. Every conceivable counter-argument notwithstanding—and I know there are many—the picnic rug on the moral high ground still came in khaki and red, the colours of his beloved regiment. My father-in-law stood on the high ground, wielding a pair of secateurs, chopping, felling and dead-heading, without a care in the world. I can’t bring myself to sing at an Anglican funeral, just as I couldn’t—were it an Orthodox one—wail as my female ancestors were expected to. In Serbia old women were sometimes even paid to mourn. They walked behind the coffin in the funeral procession and celebrated the dead in wailing laments delivered in rhythmic, haunting pentameters. I am stuck somewhere between the singing and the wailing, speechless. I wish I could say—as people sometimes expect of cancer survivors and immigrants alike—that I am grateful for each and every new day on this green island. Ask me how I am today and chances are that I will respond with that very English “Mustn’t grumble”. Which doesn’t mean that I don’t. Which doesn’t mean that I am not grateful. ** ”fensi” meaning pretentious rather than just “fancy”, cf. the recent Chinese zhuang B. This entry was posted in China, drôlerie, European, gender, language, other and tagged Iron Curtain, Python. Bookmark the permalink.